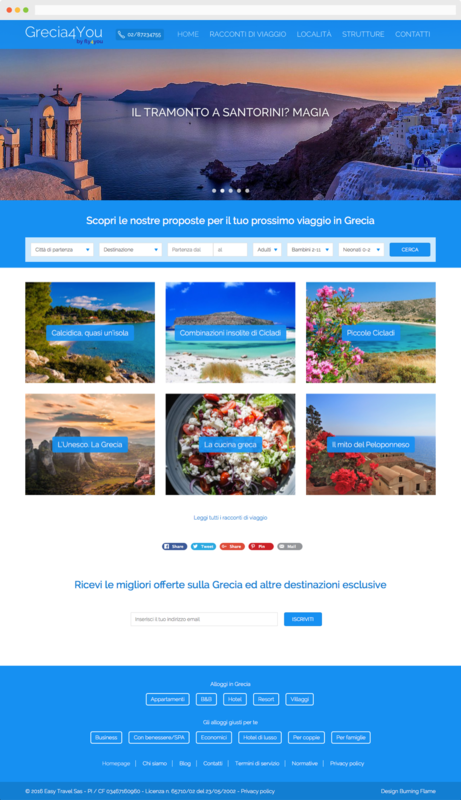 Grecia4You is the new web reservations portal by Fly4You brand, Milan travel agencies franchise. The portal allows browsing of travel stories, information on tourist locations and detailed charts of the best Greek structures. There is a booking system, with complete search engine, dedicated to the selection of your favorite travel proposal. The layout of the website, mobile-first responsive, guarantees full use of content from any device, desktop and mobile. During the development phase has been paid particular attention to the SEO (Search Engine Optimization), optimizing publications for placement on search engines. The backend platform, based on WordPress CMS (Content Management System) allows managment of contents with a simple and intuitive interface, offering the ability to update and import the travel packages to be offered to users.